Through my time working in development, I have come across many misguided concepts. One of the most common is the idea that there is a silver bullet that can achieve development, that there is one solution that will help people to live a dignified and fulfilling life. I see many organizations that have chosen their method and move forward unaware of or without acknowledging the intricate problems faced by the materially poor of the world. I have listened to people tell me that UMF’s integral approach to development is misguided and that we would be able to serve better if we focused just on microloans, or just market access, or just community development projects. However, my experience has continually reinforced my belief that integrated development efforts based on the specific needs of communities is the only way that sustainable development can be achieved. One example of a silver bullet has been brought to the front of my mind recently, and I feel the need to talk about it: the idea that poor people don’t need financing, they need savings accounts—all they need is a way to save money, and they will be able to pull themselves out of poverty. This idea assumes that poor people simply aren’t intelligent enough, aren’t hard-working enough, or lack the proper manner to save money to care for their families. It also assumes that they face the same issues that we do in the developed world. It says that rules for poor people should be different than rules for rich people. While most people would like to look at their lives and claim, “I built that,” without outside help, it just isn’t the case. Most students who have graduated from college have had their education financed, whether through governmental, private, or family money. Most people who own a home have a mortgage spread over decades. Most people who own a car have a loan to pay for it. And it is rare to find a business that has been completely funded without loans for growth. So where do we get the idea that poor people can grow their business, repair their home, purchase new land, or deal with major illness through the simple mechanism of savings? By the sheer nature of being poor, they have much less money to work with, and generally there is much greater demand on the resources they do have. A family that lives on $1/day does not face the same choices that we face in the developed world. A dollar can buy a school notebook, 3 lbs. of beans, or two cinder blocks. It cannot buy all of them at the same time. It cannot come close to buying an $8 pair of rubber boots to protect their feet, a $10 school uniform, or even one $9 sheet of aluminum roofing for a home. And yet, we look at the developing world and say that they need to be better at saving their money. The fact of the matter is when a family needs food, a child needs a notebook to study, or a home needs a new piece of roofing material, I would consider it irresponsible to put extra money in savings rather than address those immediate needs. A friend of mine recently brought me a proposal for a $6,000 home, made of cinder blocks, to replace his current mud-brick and wood home, which has deteriorated beyond repair. The home includes a kitchen, 2 bedrooms for him and his 10-person family, which includes children and grandchildren, and a bedroom to care for sick persons in his community (as he serves as the local doctor in his community). Altogether, the home is 29’ x 15’, or 435 square feet. 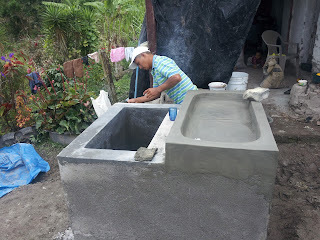 A day laborer makes $6.50 per day in rural Honduras. This means he would have to work every day for three years without spending a penny if he wants to build this house. More realistically, if he works an average of 3.5 days a week—an amount that is still generous considering the many times when work is scarce—he would have to work five years straight without spending a penny. If he saves 25% of his income, it would take a full 20 years. Why shouldn’t he have access to a 30-year mortgage to build his home? Why do we tell him that he needs to save his money to rebuild a house, as we make monthly payments on a mortgage or student loans? Why do we think that we should live by different rules than poor people? Savings are important in the developing world, just as they are in the developed world. But, as they are used in the developed world, savings in the developing world should be used for smoothing out cash flow ups and downs. Savings should be available to purchase agricultural supplies for a field, medicine for basic illness, or schools supplies for children. We shouldn’t expect that savings be used to build homes, purchase land, or pay for higher education. Investments like these need innovative, long-term financial solutions that are tailored to the unique needs of low-income persons. These need to be available to people without formal collateral or credit histories, and they need to be tailored to the needs of clients. But, microloans are not a silver bullet, either. The world’s poor face myriad issues, and they must have access to integrated services that reflect this. Development must include not just savings or microloans, but also access to insurance, markets for goods, proper health care, a good educational system, clean water, and basic sanitation and hygiene systems. People in the developed world have access to health insurance, life insurance, vehicle insurance, and house insurance. Farmers in the developed world have access to agricultural insurance that protect them in the case of natural disasters or drought, and commodities markets to protect them against swings in the price of inputs and the sales price of their harvest. All of these must be made equally available to the world’s poor. In the developed world, we often take for granted access to clean water, sanitation systems like black water treatment, and hospitals that are well staffed and stocked with new technology and medicines. However, the world’s poor often do not have access to some, if any, of these services. Giving access to financial instruments like savings and microloans is insufficient without guaranteeing access to drinkable water. The different issues that the world’s poor face are not independent of each other. A farmer who is sick from unclean water or contamination because of the lack of proper sanitation systems will be unable to work. If he also lacks access to doctors or medicine, simple illnesses may extend for weeks, months, or may incapacitate the farmer. People in the developing world face great challenges, challenges of a complexity and magnitude that we do not face in the developed world. It is time that we abandon the idea that there is a single silver bullet that can help them overcome these challenges, and begin working to create the integrated financial, educational, and health services that are necessary. It’s simple, really. Six signatures on a piece of paper. 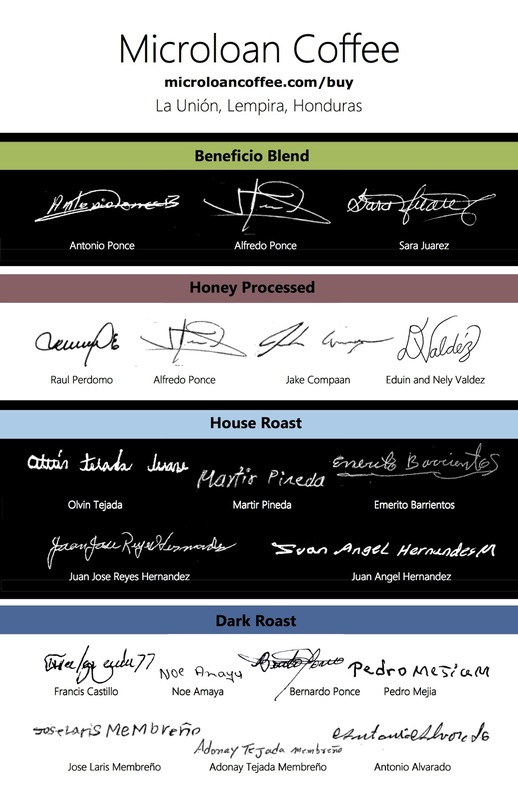 Six signatures of the producers whose beans are included in our holiday roasts. Alfredo Ponce. Sara Juarez. Raul Perdomo. Antonio Ponce. Jake Compaan. Eduin and Nely Valdez. But these signatures change things. When each of these producers signed the contract to sell their coffee through UMF, they weren’t just writing down their names. They were rewriting the story of coffee. Coffee is often seen merely as a commodity, purchased for cheap and processed carelessly, roasted and flavored and resold again and again until the final product is as distant as possible (physically and philosophically) from the farmers who grew it. But these are not nameless, faraway farmers. And we are not thoughtless consumers. We want to tell a story of thoughtful consumerism, a story of direct links to the people who produced the coffee in your cup or the food on your plate. The benefits of this type of direct consumerism range from tangibles like fair wages for producers to intangibles like a sense of global community and responsibility. So in releasing our two holiday roasts for the season, we proudly display the signatures of the coffee producers who contributed to them. We highlight their signatures in an effort to highlight them, the individuals who carefully cultivated these beans over the last year. This is the story of coffee we want to tell. The holidays are upon us. This means purchasing gifts for family and friends, brewing a hot pot of coffee on a cold morning, and hosting dinners or gatherings that end with cups of coffee around the table. We encourage you to use these opportunities to join us in telling this story of coffee - the story of thoughtful consumerism and, ultimately, the story of people. Join us in telling this story. Buy a bag to brew or give as a gift. Get to know our farmers. Read about what makes this coffee so great. This blend features the coffees of Alfredo Ponce, Sara Juarez, and Antonio Ponce. Their coffees were processed at UMF’s beneficio, or coffee processing facility. It was our first year running the beneficio, so all three producers displayed trust in choosing us to process their coffee. All three producers are amazing members of their community. Alfredo Ponce lives and works in La Unión, at a facility across from our office. Sara, also from La Unión, is the matriarch of a family of coffee farmers. Her son is Fito Juarez, another producer we have purchased coffee from (read about him here). Antonio Ponce, or Toñito, is a leader in his community of San Carlos. His story was featured in a series of articles in Fresh Cup magazine and we’ve collaborated with him, his community, and the amazing organization METAD on a clean water project in San Carlos. Their coffees combined beautifully into a smooth, sweet cup with notes of berries and brown sugar. This coffee comes from two fincas, or coffee farms. The first is that of Alfredo Ponce, the producer who also contributed to our Beneficio Blend. The second finca belongs to Raul Perdomo, Jake Compaan, and Eduin and Nely Valdez. All are teachers or administrators at the Vida Abundante Christian School in La Unión. These producers used a special technique to process their coffee called pulped natural processing. Coffee beans are usually washed after they’re removed from their fruit, but pulped natural beans forgo this washing and are dried with the sweet fruit pulp left on. This leads to a very fruity, bright flavor with strong notes of raspberries and champagne. Interested in buying a bag? Contact us or purchase online here.